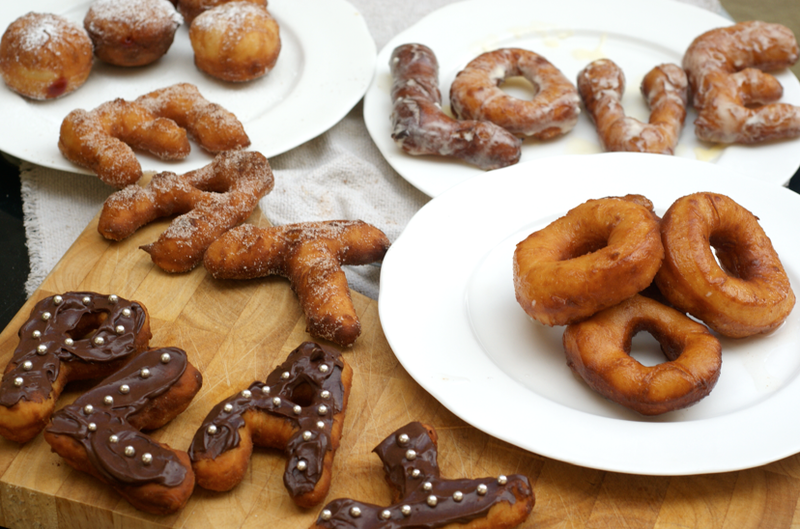 I decided to try and make alphabet doughnuts and form words with them. I just had to think of the words. This took me ages - they had to be short, I wanted there to be a few and for them to have a theme and I just like words a lot and couldn't decide. One of my first thoughts was an Alice in Wonderland 'Eat Me' ('Drink Me' doesn't make much sense when you're thinking about doughnuts!). In the end I went for a bit of a mix-up of the film title Eat Pray Love, changing it to Eat Play Love. I have a tendency to take things too seriously, especially when I'm stressed (read: once I'm back at Oxford). So this was a bit of a reminder to myself to remember to lighten up and mess about a bit. I even pushed past my normal dislike of sprinkle-type things to add silver balls to these. Thought I had better live on the wild side. I still don't really like them! To make the letters I cut out some templates and then cut them into the right shape with a sharp knife dusted with flour. Along with the alphabet doughnuts, I made some simple rings. 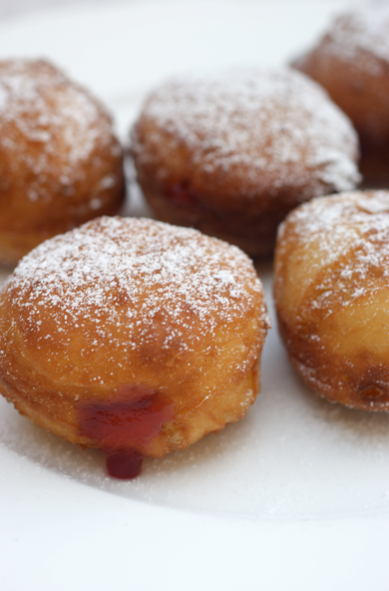 I also made some filled with raspberry jam spiked with plenty of lemon juice. 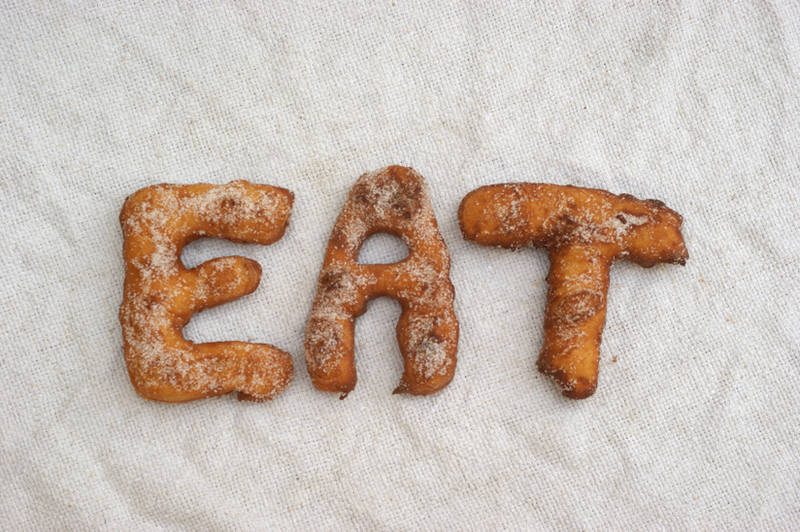 I rolled the 'eat' doughnuts in cinnamon and sugar, glazed the 'love' with the glaze recommended for the pumpkin doughnuts and topped the 'play' ones with chocolate icing. 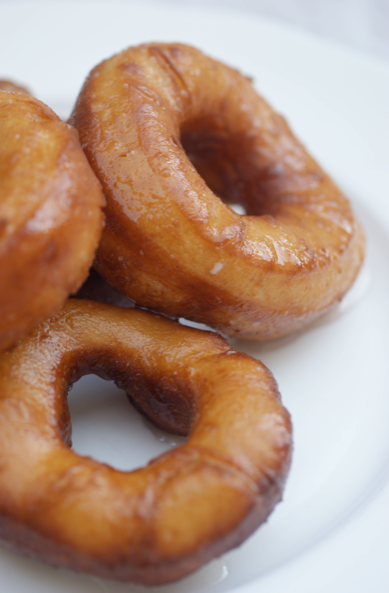 The plain rings were dipped in a simple sugar and water glaze. This was all from a half batch of one recipe - I don't even want to think how many there would have been if I had made the full amount. I have to admit that apart from the filled doughnuts, I wasn't really a fan. Even the filled ones weren't as good as I was hoping they would be. The recipe (the Alton Brown one) had rave reviews from other Daring Bakers so something must have gone wrong - or I just have a different taste in doughnuts! I must say that you did an awesome job with those letters! I can't picture cutting letters with a knife on that sticky and very wet dough! I wasn't successful with a star shaped cookie cutter! Your doughnuts are so much fun! I don't think I'll ever cut anything with a template and a knife again after the sugar cookie challenge. I'd love to try one of your raspberry jam ones. Mmm. Just gorgeous...love what you did with the challenge! 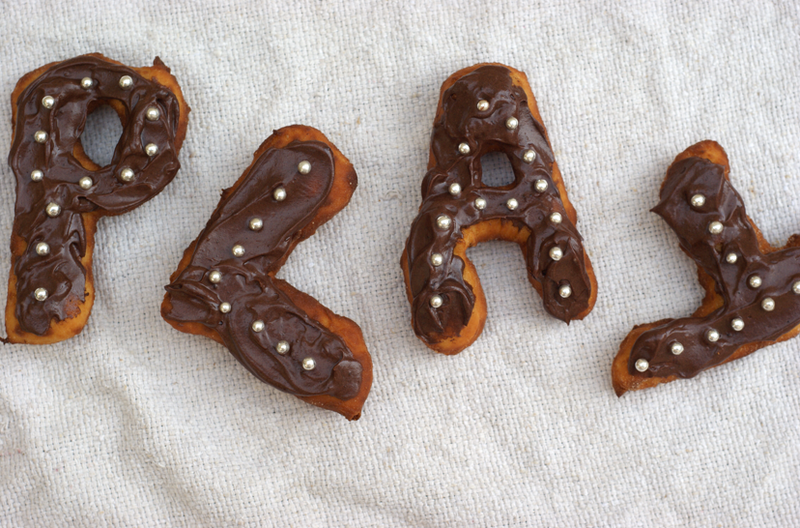 I love your doughnuts! They are so much fun it's a shame after all that work that they weren't to your taste! Wow! For someone who is stressed and busy you certainly went all the way on this challenge! Amazing! 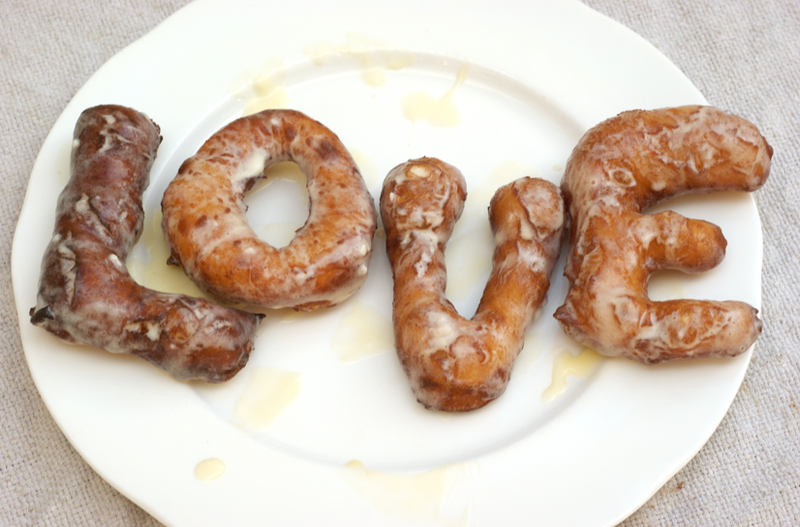 Love love love the letters and just plain want to try the filled doughnuts. Excellent job on this challenge! They're fabulous! I especially love 'play' and those jam doughnuts look delicious. Even if the donuts didn't turn out as yummy as you had hoped, I love the creativity behind them! Not to mention all the different versions you made. Great job on this challenge! To know what you are actually doing when your kneading (fold like a handkerchief, be gentle, don't ruin the air bubbles etc etc), even brioche, hot cross bun or doughnut is just its enriched version. Without PAUL, I wouldn't know when the bread was fully, fluffily risen. Sorry if you know all of this already, but it was a great learning curve for me in such a short time (including afternoon tea and masses of bread) that I just wanted to recommend it. But you probably have already done that sort of thing already. Maria - Thank you so much for your lovely comment - I may well go and do that course when I next have time. It looks really interesting and you've really sold it to me! I don't know much about bread making really - I'd love to find out more. My dried yeast was also pretty old (like 9 months old...whoops) so that won't have helped.